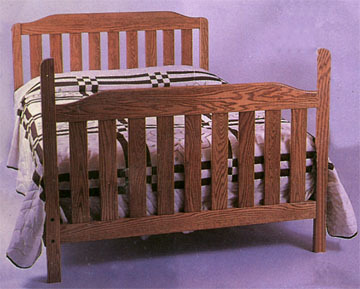 Just make one little purchase when your child is born, and never need to buy another bed for your child again! They say seeing is believing, so have a look for yourself. It’s as easy as 1 - 2 - 3! 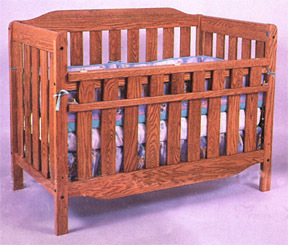 Exceeds consumer products safety commission standards in all respects - from the strength of the crib, to the distance between the slats, to the safety of the gates - this is one very safe crib. Made of solid oak, or solid cherry for a solid value, and built to last a lifetime - it has to be! Available in a variety of styles and finishes to match your decor - see below. 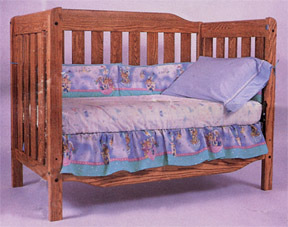 One more simple conversion and your bed becomes a double bed for your full-grown teenager. See - we told you! One small price at the beginning, and at least 18 years of use - one size truly does fit all. Now look below to check out all the styles and prices that are available.